Discover the personal computer and internet, ask questions, and join in group discussions. Treats! Now do we have your attention? 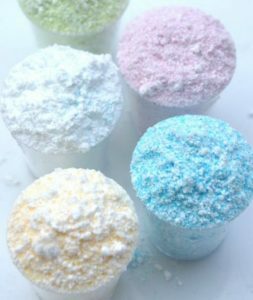 Develop a taste for science by making fizzy sherbet while learning the science behind your sense of taste! Chemical reactions never tasted so good! Join the fun and browse our selection of science books at 2:30 in the meeting room! Tween Craft at 4:00 p.m. Ages 8-12. We will be making a thanksgiving placemat. Program is free. For more information, call the South Webster Branch Library at 740-778-2122. 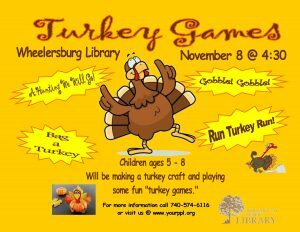 Join us for some Turkey Games and a craft. This program is for ages 5 - 8. 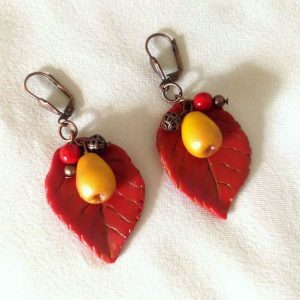 On Thursday, November 8th at 4:30 p.m., teens ages 12-18 are invited to join us at the New Boston Library to assemble your very own Autumn earrings. The earrings are made of glass and are a perfect touch to any fall look! This program is free and all supplies will be provided. For more information, call 740-456-4412. All ages are invited to join us for this magical, fairy tale event at the Main Branch. 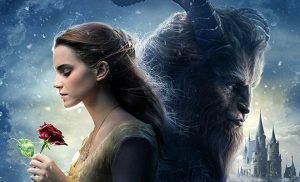 Create thematic crafts and attend a shadow-puppet theater followed by a special live performance featuring Belle. Keep the memory of this special evening alive forever by having your photo taken with characters from Beauty and The Beast in front of a rose-covered castle. No registration is required.